A bow shock is created in space when two streams of gas collide. 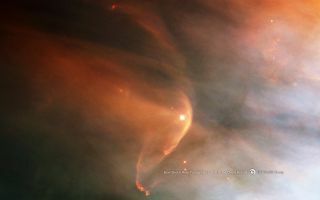 This cool space wallpaper shows a bow shock is created in space when two streams of gas collide. The young star LL Ori Emits a solar wind, a stream of charged particles moving rapidly outward from the star. The material in the wind collides with the gas evaporating away from the center of the Orion Nebula, creating the crescent-shaped collision area in the image.